The smallest storage sensation in recent memory! 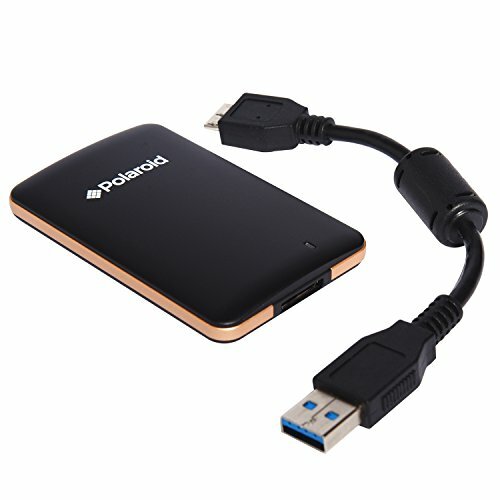 Safely travel with an enormous amount of data with the External SSD Drive by Polaroid. Featuring the slimmest, most compact design on the market, this quality crafted storage device lets you access your most important files at a moment's notice. Compatible across all major operating systems, this tough but tiny drive boasts impressive versatility with its shock resistance and USB 3.1 and USB 2.0 support. Manage pictures, videos, and a variety of projects at home or on the road with snappy read speeds up to 430 MB/s and write speeds up to 390 MB/s. From gaming and entertainment to work and beyond, keep your data safe and secure in a dependable device that fits in your back pocket! Access diverse data in a flash! Limitless storage space that goes everywhere you do!